Face masks are an easy and inexpensive way to perk up your skin and pamper yourself. Different types of masks can be purchased (or made at home) to accomplish many different skin benefits. You might think that using a face mask is simple - apply the product and sit for a few minutes, but there are ways to get even more out of the application. Face Masks can help improve your complexion in minutes, taking skin from dull and dry to glowing. Here are some steps to getting the most out of your face mask. There are so many types of masks that benefit several different issues. Determine what you want your mask to accomplish - hydrate your skin or clear up oil, get rid of breakouts or an anti-aging product. Once you know what kind of mask you need, to benefit your problem areas. Making sure the face is free of any leftover product, dirt and natural oils will help the mask to absorb deep into the skin and pores. Start by removing any makeup. Gently cleanse the skin with a mild cleanser as you don't want to stress the skin. Using a mild exfoliant will help the ingredients in the face mask absorb into skin more effectively. Steaming the skin or placing a warm towel over the face before applying the mask will open the pores and make it easier to extract impurities from the skin such as blackheads and whiteheads. 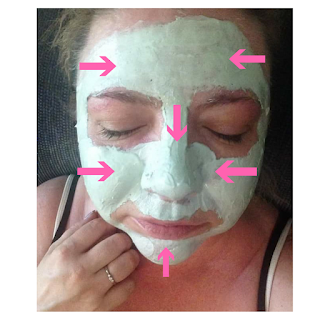 The mask will be better absorbed into the skin, penetrating deeper and removing toxins. Steaming also helps blood flow circulation into the skin while allowing your body to perspire and release toxins. Using your middle three fingers, apply the face mask or use a face mask brush. Start by applying the mask on the neck and work up onto the face trying to get an even application. Apply around the hairline, bringing the mask from the hairline towards the centre of the face - avoiding the eye area, eyebrows and lips. I like to apply downwards on the nose area. Relax for 10 – 20 minutes (or recommended time). If you have some cucumber slices, chill the slices and put on your eyes. Cucumbers are soothing and cooling and will add hydration while reducing any puffiness around the eye area. Use warm water and a washcloth to gently remove the mask. You can also place a warm towel over the face for a few seconds and gently use the towel to remove the mask, the steam will open the pores making sure product or excess oil is not left in the pores. Don’t forget to wipe away the mask from around your hairline and under your chin. If your mask is resistant you can use a gentle cleanser to remove any leftover product. Once you've washed off your face mask, splash the face with cold water to close the pores and then finish off with a few skincare products. Apply a small amount of serum and then your favorite moisturizer. This step is so important because a face mask can leave the skin dehydrated which can cause an overproduction of oil. This will complete your face mask routine and leave skin glowing. I hope you have picked up a few tips!